Aqua-Pure® Models ICE120-S and ICE125-S single-cartridge water filtration systems assure consistent high-quality water for commercial cubers and flakers by reducing the harmful effects of sediment and chlorine at flow rates to 1.5 gpm (5.7 lpm). Built-in scale inhibition reduces the ability of calcium and magnesium to precipitate on the evaporator plates as hard scale. ICE120-S combines cyst, sediment, chlorine taste and odor reduction while providing protection from the harmful effects of chlorine corrosion and scale for up to 9,000 gallons (34,069 liters). Effectively reduces sediment and chlorine for equipment protection and clearer, great-tasting ice. Certified by NSF to Standard 53 for cyst reduction (ICE120-S system). NSF Standard 42 and/or FDA CFR-21 compliance provides assurance of safety. Built-in scale inhibitor reduces lime scale build-up on evaporator plates as tested by CUNO. Patented* valve-in-head design simultaneously shuts off and vents water with 1/4 turn, allowing for simple and trouble-free cartridge change-outs. SQCT - Sanitary Quick Change - encapsulated cartridge design allows for fast and easy change-outs with a 1/4 turn while minimizing the possibility of leakage and contamination. 3/8" FNPT horizontal inlet and outlet ports allow direct or easily adaptable connections to existing plumbing lines. 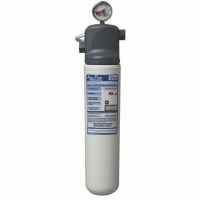 System includes a head assembly with integral mounting bracket, pressure gauge, and a single cartridge filter. Inlet and outlet plumbing connections are 3/8" FNPT. Filter cartridges are double o-ring seal type. and operating temperature of 100°F (38°C). Recommended service flow rate is up to 1.5 gpm (5.7 lpm). Filter cartridges incorporate carbon block media and scale inhibitor. System is NSF Standard 42 and/or CFR-21 compliant. Cartridge body is constructed from high-impact glass-filled polypropylene. Do not use with water that is microbiologically unsafe or of unknown quality without adequate disinfection before or after the system. Systems certified for cyst reduction may be used on disinfected water that may contain filterable cysts. EPA Establishment Number 070595-CT-001. CUNO Incorporated recommends regularly scheduled maintenance and replacement of the filter cartridge(s) in order for the product to perform as advertised/sold. Change the filter cartridge at least every 6 months. CUNO shall not be liable for system failures due to improper maintenance. Dimensions (Diameter x Height): 4" x 17"